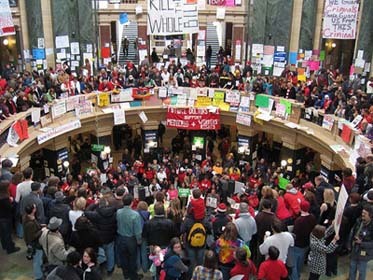 With a spirited occupation of Wisconsin’s State Capitol Building continuing, the fight for public employees’ rights was foremost on the national scene this weekend, though you wouldn’t know it from the national media. Organizers estimated up to a quarter million people converged on Madison on Saturday to defend Wisconsin’s unions, among the largest protests in Wisconsin history. There’s a lovely photo slideshow here. Union workers descended on other Midwestern states where Republican governors have made their own union-busting proposals. Tens of thousands more demonstrated in all 50 states in support of Wisconsin workers. move to kill collective bargaining rights for state workers. Here are some ways you can help. 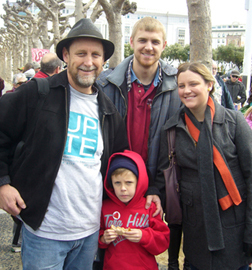 UPTE members joined thousands of demonstrators defending collective bargaining rights in Sacramento on Feb. 20, and again in San Francisco on Feb. 27 (at right, Berkeley UPTE member Jim Hockridge with family). CWA is organizing a national fight-back and is hosting a national town hall phone call on March 2. And solidarity is growing from some unexpected quarters. Hundreds of Wisconsin police joined the protest and announced on Feb. 25 to the crowds inside the occupied State Capitol Building: “We have been ordered by the legislature to kick you all out at 4:00 today. But we know what’s right from wrong. We will not be kicking anyone out, in fact, we will be sleeping here with you!” Even the union representing NBA basketball players declared that it stands with Wisconsin workers. Despite the incessant anti-union and anti-worker rhetoric coming from right-wing ideologues like Rush Limbaugh, Sean Hannity and Bill O’Reilly – who, it was discovered, are union members themselves – reality-based facts are emerging about the issue. Jake Tapper, on ABC’s Sunday news program, pointed out to North Carolina’s anti-union governor that there is no correlation between collective bargaining rights and state deficits. Conservatives are alleging that taxpayers are responsible for public workers’ pensions. In fact, as this Forbes.com blog points out, taxpayers contribute nothing to public worker pensions. UC Berkeley’s Harley Shaiken highlights the importance of this struggle for unions and workers. Meanwhile, UC regent David Crane has published an op-ed piece arguing against public sector union rights. Last week, we mentioned Prof. Charlie Schwartz’s report on a $4 billion gap in UC’s budget. His follow-up report resolves the mystery but raises more questions. Last year’s eight-part series about UC regents’ conflicts of interest recently won a James Madison Award for independent journalist Peter Byrne, and has prompted a petition asking California Attorney General Kamala Harris to investigate. Another petition is circulating to “demand that UC drop all charges and pending student conduct proceedings for activist students and workers” who demonstrated last year to save public education. UCSD is embroiled in another racial controversy, as it was last year. An offensive response to an e-mail to students has prompted worry about student distress over unresolved racial problems.